This article describes a few basic tips and drills you can use to become familiar with the proper breathing technique used while swimming. This is useful because when you take up swimming, learning proper breathing technique is often one of the significant challenges one faces besides learning how to float. Once you have good breath control and have learned proper swimming technique, breathing often fits in seamlessly with your stroke, and relaxed swimming becomes possible. 1) Wear swimming goggles. Without goggles, water gets in your eyes and irritates them. Furthermore, having water in the eyes makes you virtually blind, which can lead to anxiety. On the other hand, you have one thing less to worry about when you use swimming goggles. As a consequence, you are more relaxed and learning proper breathing technique is easier. 2) In those swim strokes where you submerge your head, don’t hold your breath but exhale continuously when your face is in the water. If you do this well, your lungs should be nearly empty when you rotate or lift your head to breathe again. 3) Inhale quickly when your mouth clears the water. This should occur naturally if you have exhaled properly in the water before, as explained above. The following basic drills can be used to get familiar with the breathing technique in the water. Wear swimming goggles to practice those drills. Drill #1: In shallow water, hold your breath, then crouch down, so your head gets under water. Stay in that position for a few seconds, then rise up. Drill #2: Same as drill #1, but exhale underwater through the nose, so you blow bubbles. Drill #3: Same as drill #2, except that you now blow bubbles both out of your nose and your mouth. Drill #4: In shallow water, crouch down until the water surface rests between your nose and your mouth. Now practice inhaling above water through your nose and exhaling underwater through your mouth. 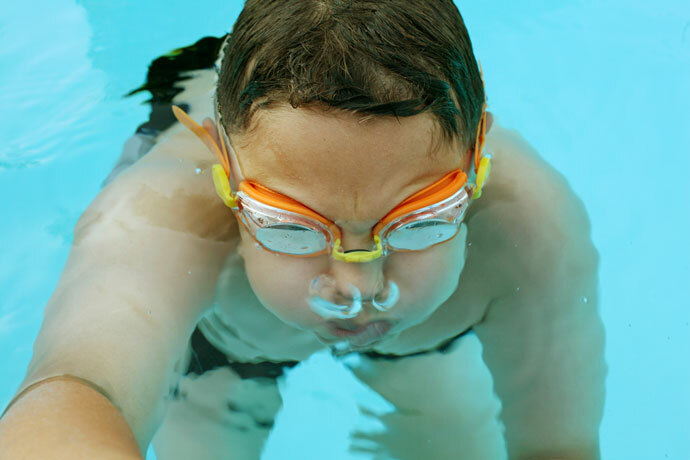 Drill #5: In shallow water, submerge your face and blow bubbles through your mouth, nose, or both. Then hold onto the pool edge and try to get into a horizontal position with your face turned downward. Continue to blow bubbles through your mouth and nose. To get into the horizontal position, you can use a relaxed flutter kick. Drill #6: Bob up and down with your body in shallow water. Inhale while your head is above water and exhale while your head is under water. This drill makes you get used to rhythmic breathing, a skill that will be useful later on when learning the different swimming strokes. Overview of breathing technique in swimming. 8 drills to learn to breathe in the front crawl stroke. Nice article. I was a little confused about breathing from my nose vs mouth in class (returning adult). I was trying to breathe only out of my nose, and it was difficult since I’m allergic to chlorine, and my nose gets stuffy. Doing both is no problem. Great info! I have a HUGE fear of the water! I love being in it as long as my feet can touch the bottom. Good for you taking classes! I love being in the water. Things are coming back to me. I guess I did a little water ballet [or whatever you call it now] underwater, but never really got the strokes & breathing down so I could do laps/freestyle. An older lady is in my class who is petrified. She’s in her 2nd session and not putting her head in yet. But I gotta give her credit for being there, and our instructor has all the patience in the world (I’ve watched her with the G-kids!). It is so easy in salt water. I can barely concentrate on my breathing technique in chlorinated water. The two video clips on breaststroke differ. The first one shows that one doesn’t glide. As soon as the hands are stretched, the arms are pulled sidewards and downwards. At the same time, the legs are bent at the knees and getting ready to kick. The second video shows the body, hands, and legs are allowed to glide for sometime before the arms start to pull. For maximum efficiency, a glide phase should be observed. That’s because during this glide phase, your body will experience less drag as it doesn’t cut the water surface but is completely under water instead. Obviously, the glide phase shouldn’t last too long or you will decelerate too much and lose efficiency as well. I am trying these breathing techniques… They are useful. Fear decreases when I use goggles… Thanks for the tip! Took my first swimming lesson. Yes! It was very scary. I hate water but I want to overcome my fear. But I didn’t get my breathing right. So hard to get it right. I’ll do better the next time. Super, I love this article, thanks for the information. One of the things I’m not sure about is whether it’s best to breathe in through the nose and exhale through the mouth with pursed lips or inhale through the mouth and exhale through the nose. I have heard both from swim instructors. All have their own idea. I personally breathe in and out through nostrils on land and find inhaling through the mouth can feel awkward and dry the throat. I am a yoga master, and yoga breathing is natural. Front crawl breathing is what I am working on presently. Inhaling through nostrils and exhaling through the mouth seems to be working for back crawl, side swimming, treading water and sculling. Well then guess I have my own idea too :-). I think in front crawl you need to breathe in through both the nose and the mouth. I think it will be difficult to only breathe in through your nose and get enough air because the timespan your nose (and mouth) clears the water is short, and especially if you swim faster. I exhale through both my nose and my mouth as soon as my face is under water again. I then spit out any water that might have gotten in and close my mouth until the next inhalation. So to recapitulate, do what works best for you, just don’t hold your breath underwater. Has anyone had a tightness in their chest lasting days after a workout? It feels like bronchitis – when you take half breaths and can’t get a full breath. My Doctor says it’s muscle inflammation? Sorry I never heard about something similar yet. It’s entirely possible that your pool is over-chlorinated (especially if it’s indoors) and that your lungs are irritated by the fumes. My wife finds the fumes at our pool absolutely intolerable. I frankly fear that the fumes are irritating my lungs but that I’ve simply become inured to them and don’t notice. Useful for beginners and to prevent injuries. I can’t believe I waited so long to learn to swim. I am 67 and started 4 weeks ago. All these years I have been petrified to put my face under the water, I can’t believe I did just that in the first lesson. All I can say is it’s great fun and I’m enjoying every minute. This is amazing Sonia! Congratulations and keep going! I’m 67 also, started my lessons about 4 weeks ago. I am petrified of the water also. I wish I had learned when I was younger. I think I will be okay when I learn to breathe properly. The thing that troubles me as to freestyle and breathing is the inhalation. I have no trouble at all exhaling but I’m pretty sure my inhalation is inadequate. I don’t feel that much if any air goes into my lungs and what little I inhale doesn’t go beyond my mouth. Could I be turning my head too quickly? Alternatively, when I do backstroke (or my version of it!) the breathing seems to come fairly spontaneously. It could be that you are kicking too hard because of a lack of balance. I often see this with beginners. http://www.enjoy-swimming.com/crawl-stroke.html has more information about breathing in front crawl. It’s important to understand that the urge to breathe is a result of excess CO2 and NOT a lack of oxygen. I know this sounds totally counter-intuitive, but it’s true. If you don’t feel like you are getting enough air when swimming freestyle, chances are very high that – even though you say you have no problem with exhaling – you are not exhaling as much as you think or as much as you need to. As a result, you *think* you aren’t getting enough new air. The problem is actually that you aren’t exhaling all of the old air. Once I learned this and started focusing on making sure I fully exhaled before turning my head, my breathing issues virtually disappeared. I too have just started learning to swim at 68. I was terrified of water, but now I can swim a few yards. Yes, I am having trouble with the breathing business. I love going to the pool and do a lot of exercises as well. Could you please provide me with some guidance? Your advice will be well appreciated. I would suggest that you do practice the drills in the front crawl/freestyle section if you didn’t do so already. They will take care of breathing problems among other things. The moment I raise my head above water to inhale in breaststroke, my legs go down so fast that I can’t inhale in that fraction of a second. What should I do to rectify? During the arm stroke, at the end of the outsweep, your arms and hands push down, this should help to get your head above water. I have now had 4 lessons (I am 22 and I am just now learning to swim) and I just don’t feel that I am making any progress because I can’t swim more than 5 strokes, as I can’t inhale. It is very difficult for me to give advice without seeing your technique. As you are taking swimming lessons, I’d talk about it with your swim instructor. Otherwise, please follow the drills in the “learn how to swim” section. I feel relaxed underwater doing breaststroke, but as soon as I raise my head to breathe, my legs start to go down and I panic. I know the theory, but just wonder if there is anything sure-fire I can do, because it is becoming really stuck in my head as a problem. Nice tips. It’s just that when I exhale under water, it feels like there’s a lot of spit escaping. I mean I wouldn’t pee in the pool, slobbering into it ranks second. Brilliant site and really well explained. Thank you for your effort. This is a nice article. I would like to ask one question, is it fine if I swim with a tube a few days to get acquainted with swimming? If it helps you get comfortable in the water, I don’t see a problem. As long as it doesn’t become a crutch you rely on, why not? Once you feel comfortable, have a look at our swimming lessons covering each swim stroke. I’ve been working on my inhaling in front crawl but it never even occurred to me how to exhale underwater. I’m going to try this today. Here’s hoping I can make some progress! I am 44 and have recently started to learn swimming. I have done 12 classes, but my breathing technique is not progressing at all. I exhale under water (with the nose as was taught to do so) and take the head out for inhaling, but always forget to open my mouth immediately and forget to inhale. And I am told I move my hands very fast. If I move them slowly, I start to focus on the hands, and the leg stops. How do I focus simultaneously on hand movement, leg movement and breathing? The class is only for 15 sessions, so if I don’t get my breathing in the next class I am worried I may give up… especially after seeing others who have done just 7 odd classes and are swimming beautifully. I want to swim and enjoy swimming! I will refer you to the swimming lessons for the front crawl provided on this site. Instead of trying to learn everything all at once, the swimming drills suggested in those lessons build your swimming stroke one step at a time, where you only move to the next step once you have mastered the previous step. If you try to do everything all at once as a novice, it is normal that the parts of your stroke which you don’t focus on fall apart. It is difficult for us to focus on several things at once, and that’s why learning the different parts of the swimming stroke separately makes sense. Also, please don’t compare yourself to others that learn more quickly than you. We all are different, with our strengths and weaknesses. If this can help, when I was a child and learned breaststroke in school, several of my friends learned faster than me and some even became very good swimmers. Yet nowadays I never see them at the pool. Try to find pleasure in the practice of the exercises and also in swimming. Listen to your body, feel how it interacts with the water, enjoy the feeling of being carried by the water. As I have written somewhere else on the website, the mindful practice of the drills can become a kind of swimming meditation if you learn to relax and feel the interaction with the water. Thank you so very much Christophe !! Felt motivated and positive just by reading your reply !! Will update on my progress !! Cheers !! What should I do? Is it my health problem? And are fat boys like me able to float above water? Given that this was your first swimming class, I think you just need a little patience. At this point, I would follow the instructions of your swim instructor, and it is very likely that with a little time, things will work out for themselves.